When we travel for pleasure, whether it’s a sightseeing holiday or a recreation safari, we generally cast our eyes to the far horizon. And why not? In Australia, we have at our disposal the largest island continent in the world, girt by golden sands and shining seas, where the possibility for adventure is virtually unlimited. But, as often happens, some of the best adventures lie waiting to be discovered in our own backyard. In my case, this is the Fraser Coast. Since moving to Hervey Bay, Qld, a couple of years ago, Elizabeth and I have been to Fraser Island a few times and gone whale watching on the bay, but we’d never really explored the mainland along the Great Sandy Strait south-east of Maryborough. Then recently we woke to a(nother) perfect sub-tropical day and, on a whim, decided to pack a picnic and take the truck for a drive down the coast. What a delightful trip it turned out to be. We love our Kimberley Karavan Tikay and have taken it with us on more than 60,000km of roads and tracks across the country – few rigs make such a complete and versatile home away from home, on- or offroad. Onwards, Cooloola Road stretched arrow-straight towards the tiny waterfront village of Boonooroo, where time is measured (if at all) by the tides and the number of fish in the creel. To the left of the road lay the Poona National Park (NP), 5000ha of coastal lowlands, paperbark forests and wallum heathlands around Kalah Creek. This is a great place for low-key, nature-based activities and we flagged it to return another time for the wildflowers and birdwatching. To the right of Cooloola Road lay a patchwork of cane fields and one of the largest exotic pine plantations in southeast Queensland. Motoring south under a clear blue sky, a succession of side roads delivered us to several delightfully quaint villages on the western shore of the Great Sandy Strait – Maaroom, Boonooroo, Tuan and Poona – all dozing in quiet seclusion with manicured foreshores facing Fraser Island, less than 10km to the east. 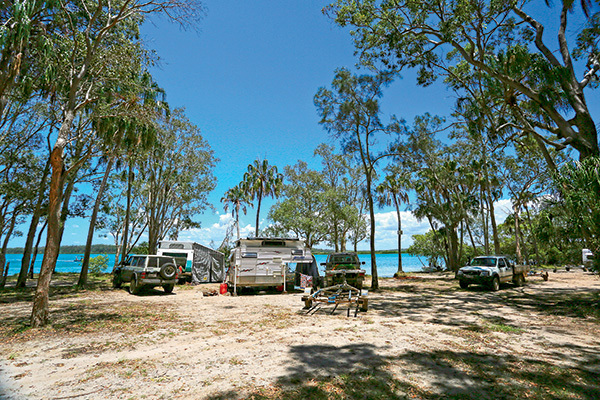 This stretch of coast is renowned as an angler’s paradise, and travellers in search of marine adventure are well catered for with excellent boat ramps, sheltered moorings among the mangroves and comfortable accommodation at several caravan parks. Continuing south, we came to another side road that ran 14km through pine forests to the hamlet of Tinnanbar, also on the Strait, at Shark Inlet. We turned here on to a rough, unsealed all-weather track used by heavy trucks hauling logs out of the surrounding plantation. The tarmac resumed after 6km and continued all the way to Tinnanbar, the only other road feature of note being a helipad at an intersection on the edge of the village. Tinnanbar was very pleasant – clean and green, a Tidy Town worthy of the name, with an expansive picnic area full of gum trees on a foreshore fringed by a sugar-white beach, lapped by crystal ripples off the strait. The only metaphorical cloud on this otherwise balmy sub-tropical horizon was a ‘For Your Safety’ sign beside the boat ramp warning that estuarine crocodiles may be present in the area. After cruising around the village to confirm the demise of the Tinnanbar Waters Caravan Park, we retraced our route along Tinnanbar Road to investigate the Tuan State Forest. About 9km west of the village, near where the bitumen ends, we turned off for the first of two camping areas, Hedleys. This road was surfaced in a mix of hard-packed gravel, corrugations and soft sand, nothing dramatic but enough to keep us on our toes, until we came to a fork. The road ahead was closed by a gate into private property that could be crossed to access the camping area, for a fee. A sign on the gate provided information and a phone number for that purpose. Veering to the right, however, led to a QPWS track signposted ‘4WD access only’ and ‘Road subject to flooding’. We chose this route and found it to be harmless enough in the dry conditions. We followed it for about a kilometre (somewhat shorter than the alternate route) and were suddenly emerged in the camping area, well shaded by eucalypts and palms, at the edge of Kauri Creek. 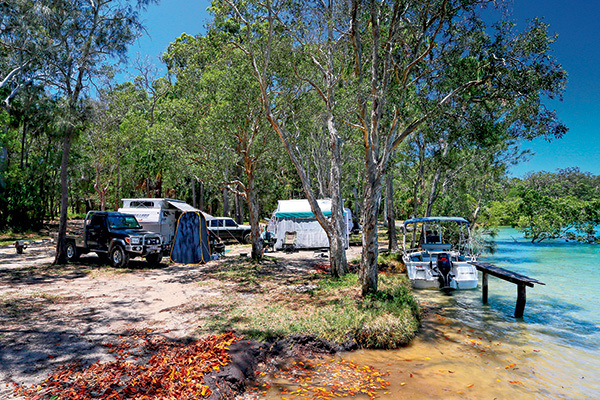 In ample spaces beside the creek were campers comfortably established in a variety of caravans, camper trailers and tents, with tinnies moored within easy wading distance from the shore. A walk around the camping area confirmed these self-sufficient campers were quite in their no-frills domain and that there were plenty more spaces among the forest further back from the creek. Apart from the boating and fishing, there is much to love about this destination’s natural environment. 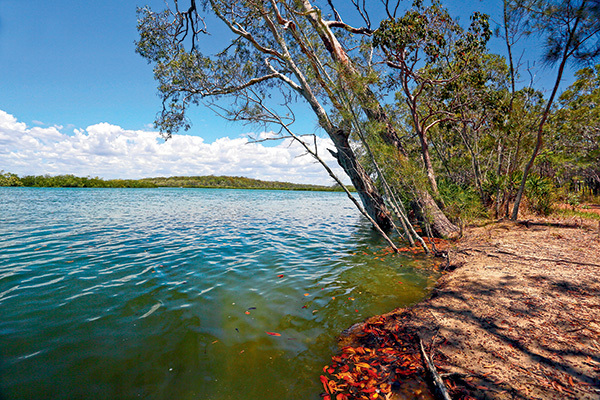 Tuan State Forest conserves valuable coastal landscapes – wallum heaths and swamps, banksia woodland, eucalypts forests, melaleuca wetlands and mangrove-lined estuaries – that provide vital habitats for almost 200 plant species and rare wildlife. The Kauri Creek estuary is a wetland of international importance; its tidal flats and saltmarshes are feeding grounds for migratory shorebirds from Siberia and Japan; its seagrass meadows (among the most extensive in southeast Queensland) support endangered communities of dugongs and turtles; its mangroves provide breeding habitats for more than 70 per cent of the coast’s 39 fish species; rare Indo-Pacific humpback dolphins frequent the estuary and nearby Tin Can Bay. Kauri Creek is part of the Great Sandy Marine Park and its upper reaches are a Declared Fish Habitat Area. Although there are numerous opportunities for fishing and boating along the creek and in the Great Sandy Strait, some restrictions apply to encourage sustainable use and anglers should be aware of these and other fisheries regulations. Retracing our route to the Tinnanbar Road, we drove about 3km further west before diverting down a gravel side road to the Log Dump camping area, also on the banks of Kauri Creek within Tuan State Forest. It bore many similarities to Hedleys with grassy sites spread throughout a forest glade, all within easy walk of crystal Kauri Creek. One important addition is a hybrid composting toilet. Anglers have a boat launching area with a sandy entry to a broad tract of the creek and direct access to the Strait. Apart from water-based recreation, there’s little else in Tuan State Forest but therein lies its appeal – peaceful seclusion to nourish the soul. 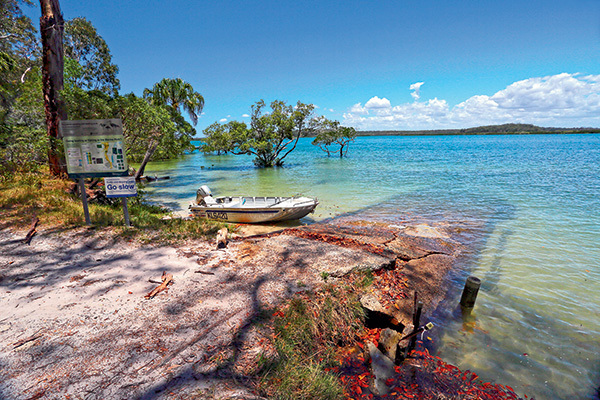 But if that’s not enough, a short drive to the south will take you to the adventure hotspots of Tin Can Bay, Rainbow Beach and Inskip Point and, from there, it’s only a 10-minute barge ride to World Heritage-listed Fraser Island. Tuan State Forest (Kauri Creek section) is about 230km north of Brisbane via Gympie. Camping for self-sufficient travellers is available at Log Dump campground and Hedleys. From Gympie, take the Tin Can Bay Road for 44km to the Maryborough-Cooloola Rd turn off and follow this for 20km, then turn east onto Tinnanbar Rd. Follow this gravel road for about 7km to the Log Dump turn-off and the camping area is a further 1km at the end of this road. The Hedley’s turn-off is a further 4.7km along Tinnanbar Rd. 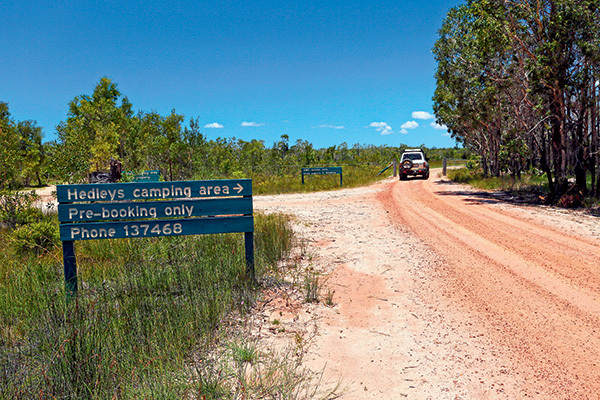 At a fork about 2km down the road to Hedley’s, veer right on the QPWS 4WD track and go 1km to the camp, or straight ahead on the slightly longer access road through private property (fees apply).